I had problems running vmware images from a mounted ntfs filesystem in Ubuntu 10.04. The problem was that the process mount.ntfs used 100% CPU and froze my computer only a few moments after starting the image in wmware-player. I guess the mounting of ntfs filesystems aren’t that good in Ubuntu. At least not when you have an application that is very write-intensive. This is where vmware-player stores ”suspend files and snapshots. The path should be relative to the image-dir and be writable to the user running vmware-player. And of course, don’t change the path to another mounted ntfs-filesystem. You should also be able to edit the workingdir by using the vmware-player GUI as well. Look at screenshot below. I love you! That did the trick. I found your post very useful. I had the same problem with my VM running from ntfs. 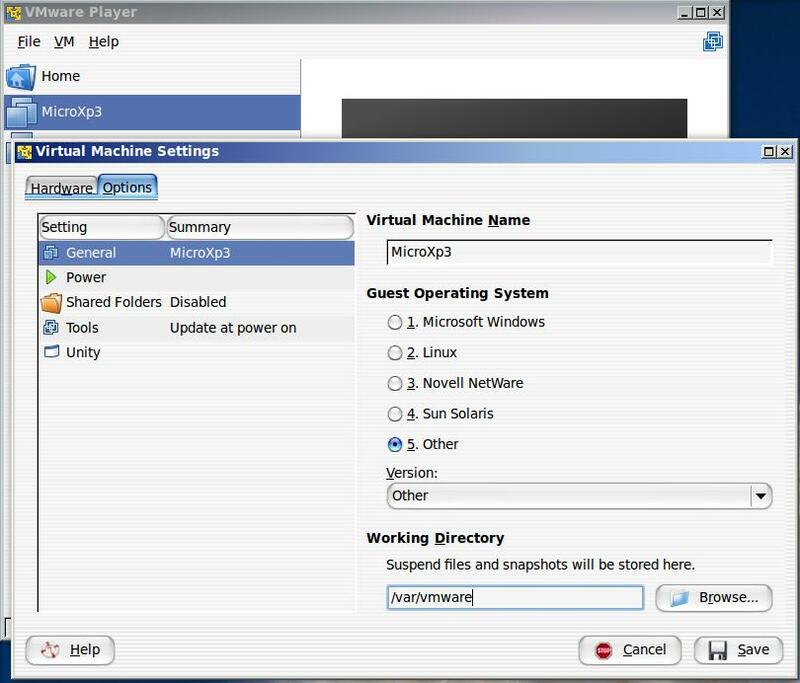 In my case – after changing the .vmx, VMware Workstation (7.1.3 build-324285) didn’t run the VM, saing something like ”Can’t run VM ’cause the working directory is wrong”, but after changing working directory from gui, everything ran smoothly. I used GUI to set /var/tmp directory. Now VMs work as they should. Just woul like to say that I am using ubuntu 14.04, and 4 years after your post, you are still saving people ! It worked perfect for me. I did like jcramalho and used /var/tmp. :) Thank you very much!